M i Nicholas Kenneth FARR-11027. Angela FARR [Parents] [scrapbook]-10874 was born 1 on 14 Aug 1972 in Lodi, San Joaquin, California, United States. She died 2 on 30 Apr 2001 in Weber, Utah, United States from of a brain tumor. She was buried in 2001 in West Weber, Weber, Utah, United States. Angela married (MRIN:4702) Jason BIRCHFIELD-10878 on 17 Nov 1995 in Jordan, Salt Lake, Utah, United States. Angela was a MAJOR fund-raiser for the Sacramento, San Joaquin County leukemia Society. Both radio and television. Leukemia Poster Child San Joaquin county. Early 80's. Aaron Adelbert FARR [Parents] [scrapbook] 1-10879 was born 2 on 25 Nov 1880 in Ogden, Weber, Utah, United States. He died 3 on 9 Sep 1939 in Weber, Utah, United States from of a skull fracture. Aaron married 4 (MRIN:4703) Alice Caroline WATERFALL-10880 on 4 Apr 1906 in Ogden, Weber, Utah, United States. Alice Caroline WATERFALL [scrapbook] 1-10880 was born on 28 Jul 1884 in Battle Creek, Owyhee, Idaho, United States. She died on 9 Sep 1962. Alice married 2 (MRIN:4703) Aaron Adelbert FARR-10879 on 4 Apr 1906 in Ogden, Weber, Utah, United States. Melvin Eugene FARR [scrapbook]-10912 was born 1 on 28 Nov 1910 in Ogden, Weber, Utah, United States. He died 2 on 1 Jul 1925 in Ogden, Weber, Utah, United States from of a subdiaphragmatic abcess rupture. He was buried 3 on 5 Jul 1925 in West Weber, Weber, Utah, United States. Melvin was counted in a census 4 in 1920 in Twin Falls, Twin Falls, Idaho, United States. William John Russell MANNING [scrapbook] 1-10885 was born 2 on 18 Feb 1879 in Hooper, Davis, Utah, United States. He died on 15 May 1927 in Ogden, Weber, Utah, United States. He was buried on 18 May 1927 in Ogden, Weber, Utah, United States. William married 3 (MRIN:4704) Lettie Estelle FARR-10884 on 21 Sep 1904 in Salt Lake City, Salt Lake, Utah, United States. Lettie Estelle FARR [Parents] 1-10884 was born on 6 Feb 1883 in Ogden, Weber, Utah, United States. She died on 23 Jul 1972 in Ogden, Weber, Utah, United States. She was buried on 26 Jul 1972 in Ogden, Weber, Utah, United States. Lettie married 2 (MRIN:4704) William John Russell MANNING-10885 on 21 Sep 1904 in Salt Lake City, Salt Lake, Utah, United States. David Logan WINTER [scrapbook] 1-10887 was born 2 on 5 Sep 1881 in Ogden, Weber, Utah, United States. David married 3 (MRIN:4705) Ella Mae FARR-10886 on 5 Aug 1903 in Ogden, Weber, Utah, United States. Ella Mae FARR [Parents] 1-10886 was born on 27 Jan 1885 in Ogden, Weber, Utah, United States. She died on 19 Mar 1969. Ella married 2 (MRIN:4705) David Logan WINTER-10887 on 5 Aug 1903 in Ogden, Weber, Utah, United States. Robert Femley GRAGG 1-10888 was born in Cal 1881 in Ogden, Weber, Utah, United States. Robert married (MRIN:4706) Ella Mae FARR-10886 on 8 Nov 1944 in Utah, United States. Ella Mae FARR [Parents] 1-10886 was born on 27 Jan 1885 in Ogden, Weber, Utah, United States. She died on 19 Mar 1969. Ella married (MRIN:4706) Robert Femley GRAGG-10888 on 8 Nov 1944 in Utah, United States. Carl Oscar BERG 1-10891 was born in 1885 in Salt Lake City, Salt Lake, Utah, United States. Carl married (MRIN:4707) Josephine Amelia FARR-10890 on 24 Oct 1911 in Salt Lake City, Salt Lake, Utah, United States. Josephine Amelia FARR [Parents] 1-10890 was born 2 on 4 Dec 1889 in Salt Lake City, Salt Lake, Utah, United States. She died 3 on 8 Apr 1976. Josephine married (MRIN:4707) Carl Oscar BERG-10891 on 24 Oct 1911 in Salt Lake City, Salt Lake, Utah, United States. 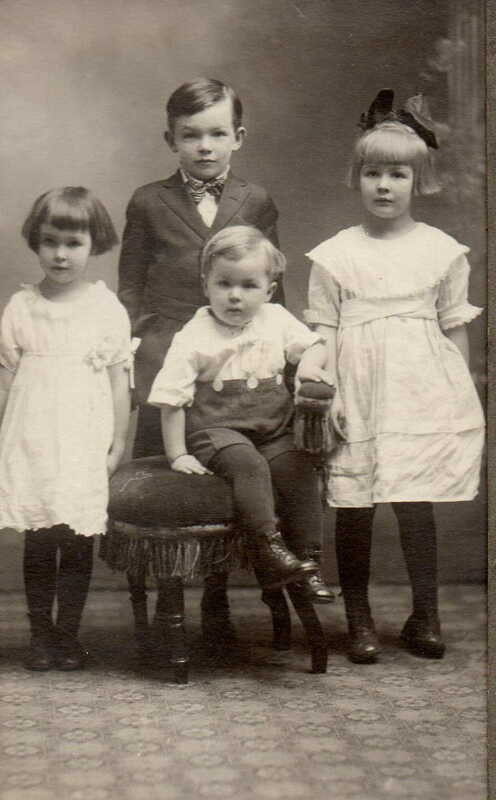 Winslow Halverson FARR [Parents] [scrapbook] 1-10892 was born 2, 3 on 16 Jul 1893 in Ogden, Weber, Utah, United States. He was christened on 4 Oct 1893 in Ogden, Weber, Utah, United States. He died 4 on 25 Apr 1946 in Salt Lake City, Salt Lake, Utah, United States. He was buried 5 on 29 Apr 1946 in Salt Lake City, Salt Lake, Utah, United States. Winslow married (MRIN:4708) Myrle ANDERSON-10893 on 14 Jun 1921 in Riverside, Riverside, California, United States. Myrle ANDERSON 1-10893 was born on 1 Oct 1892 in Huntsville, Weber, Utah, United States. She was christened on 3 Nov 1892 in Huntsville, Weber, Utah, United States. She died on 6 Aug 1985 in Salt Lake City, Salt Lake, Utah, United States. She was buried on 10 Aug 1985 in Salt Lake City, Salt Lake, Utah, United States. Myrle married (MRIN:4708) Winslow Halverson FARR-10892 on 14 Jun 1921 in Riverside, Riverside, California, United States. Barbara Jean FARR [scrapbook] 1-10894 was born on 18 Jul 1923 in Salt Lake City, Salt Lake, Utah, United States. She died on 4 Aug 1925 in Salt Lake City, Salt Lake, Utah, United States. Clarence FARR [Parents]-10899 was born 1, 2, 3 on 13 Oct 1887 in Ypsilanti, Washtenaw, Michigan, United States. He died 4 on 1 Aug 1952 in West Sumter, Washtenaw, Michigan, United States. Clarence married 5 (MRIN:4710) Josephine HOABART-13632 on 8 Nov 1906 in Detroit, Wayne, Michigan, United States. Clarence was counted in a census 6 in 1900 in Sumpter Township, Wayne, Michigan, United States. Josephine HOABART 1-13632 was born about 1885 in Michigan, United States. Josephine married 2 (MRIN:4710) Clarence FARR-10899 on 8 Nov 1906 in Detroit, Wayne, Michigan, United States. She resided in Detroit, Wayne, Michigan, United States. F i Lillian C. FARR-13634 was born on 5 Sep 1907. She died on 22 Mar 2000. M ii William J. FARR-13633. M iv Adelbert Deluctric "Delbert" FARR-13638 was born on 20 Oct 1915. He died on 31 Oct 1943. M v Clinton Edward FARR-13639 was born on 22 Mar 1918. He died on 13 Sep 2004. F vi Deneta C. FARR-13646. F vii Eva I. FARR-13647 was born on 22 Jul 1922. She died on 24 Jan 2013.